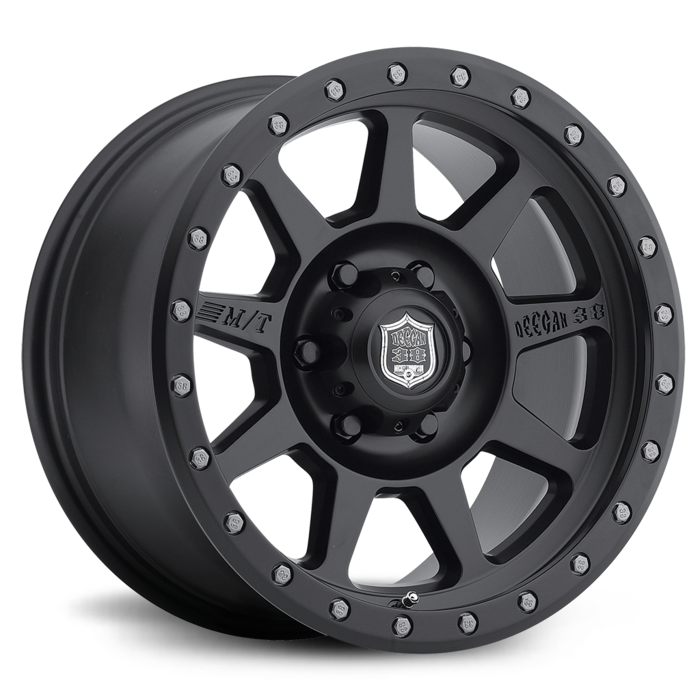 The Deegan 38 Pro 4 by Mickey Thompson features a rugged 8-spoke design with authentic zinc coated bolts in the outer lip. The Pro 4 has a durable 2-stage matte black finish and is available in sizes 15x8 through 17x9. All Mickey Thompson Classic Series, SideBiter®, and M/T Metal Series wheels require (60-Degree) Bulge Acorn (Cone Bulge) Seat Lug Nuts. Mickey Thompson recommends Duplex Bulge Acorn Lug Nuts on vehicles of GVWR of 6,500 lbs. or greater. Center caps are not available for certain applications including 1997 & earlier Ford 3/4 & 1-ton pickups, 2002 & earlier Dodge/Ram 3/4 & 1-ton pickups, 1986 & earlier Jeep, CJ models & earlier Toyota Land Cruiser models.